What Day Of The Week Is May 5? 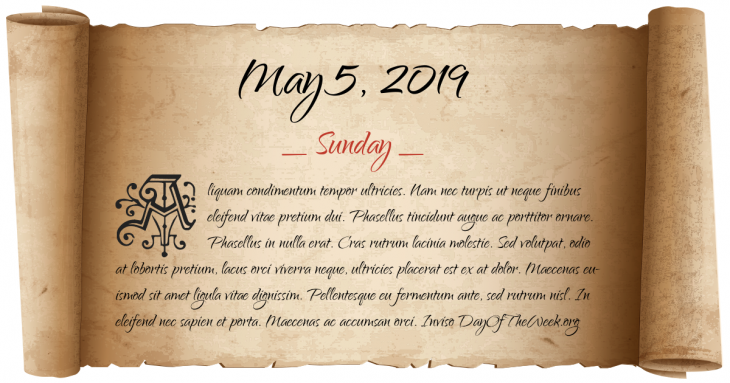 May 5, 2019 is the 125th day of the year 2019 in the Gregorian calendar. There are 240 days remaining until the end of the year. The day of the week is Sunday. The Swiss canton of Aargau denies citizenship to Jews. Authorities arrest Nicola Sacco and Bartolomeo Vanzetti for alleged robbery and murder. Italian troops occupy Addis Ababa, Ethiopia. The Treaty of London establishes the Council of Europe in Strasbourg as the first European institution working for European integration. Operation Nimrod: The British Special Air Service storms the Iranian embassy in London after a six-day siege. Who were born on May 5?